Whenever working of an air conditioner is explained, it is explained by detailing how a system with the condenser, compressor and evaporator works. Although the explanation is technically absolutely correct, but many people find it hard to understand. No wonder we at Bijli Bachao get a lot of questions from people asking various things like: “Can I use my AC to cool two rooms?”, or “Why is it taking so much time for the temperature to come down?”, or “Why is right sizing of an AC so important before making a purchase?”. It is quite valid that people ask these questions because they are not able to visualize how an Air Conditioner works. Now physics explains the basis of how various things in this world work and the best thing about physics is that many of its laws work very similar at the sub-atomic level as well as at the scale of the universe. Just like the interaction between sub-atomic particles is similar to the interaction between planets and stars, similarly, heat energy (or heat transfer) works in very similar ways to potential energy (or mass transfer). We will use this basis to explain Air Conditioning in very basic terms. Rain is filling it up. Someone has opened up a tap on top of it. Etcetera (will leave to imagination :) ). Now the task at hand is to maintain the “water level” of the tank, for which you install a tap at the bottom of the tank. Why at the bottom? Because the pressure of water is maximum at the bottom for the water to flow out fast. Why does water flow out fast at the bottom? Because the height of water creates a pressure difference causing it to come down in case the tap is opened. A room or space to be air conditioned is similar to the tank illustrated above. The heat in the room is analogous to the water in the tank. The tank is getting water from various sources. Similarly, a room gets heat from external sources like: “Heat from Outside the room through the walls”, “Hot air flowing in”, “Sunlight coming in from windows”, “People in the room”, “Appliances in the room”, etc. Just like we need to maintain the height of water in the example, we need to maintain the temperature in a room. The tap used at the bottom of the tank in the example above is analogous to “Air Conditioners”. Myth Busted: Air Conditioner does not generate cooling, it removes heat from the room and throws it outside. It is just like a tap as shown above. Evaporator (in the indoor unit of a split air conditioner): It is a heat exchanger coil that takes heat from the room and moves it outside. It is shown as number 3 above. The heat is absorbed by the refrigerant and in turn, the air inside the room becomes cool. Compressor (in the outdoor unit of a split air conditioner): It compresses the hot refrigerant gas into a hot liquid refrigerant which is ready to exchange heat from outside (the room). Condenser (in the outdoor unit of a split air conditioner): It is a heat exchanger coil that throws the heat collected from the room (by the refrigerant) outside the room. 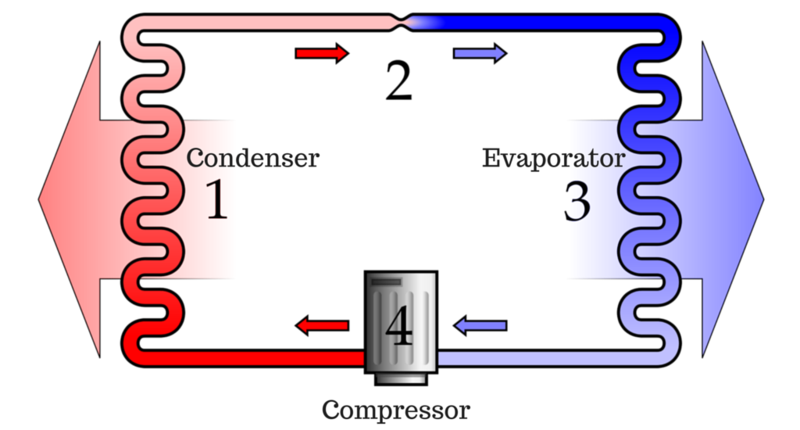 In this whole process, a key role is played by the refrigerant which gets compressed from gas to hot liquid at a high pressure in the compressor, changes to cool liquid in the condenser, gets sprayed in the evaporator and absorbs heat (from the room) and gets converted into gas again ready to get compressed. Bottom line: Just like a tap takes water from the tank and throws it outside. An air conditioner takes heat from the room and throws it outside. What’s the role of Thermostat? As we mentioned above, the height of water in the tank is analogous to temperature in the room. Now imagine you have a sensor that controls the tap and shuts it on/off when the height is maintained. A thermostat does a similar job, it shuts off the compressor when the desired temperature is achieved. How to explain the difference between Inverter Technology and Fixed Speed Air Conditioner? If we take the same analogy, a fixed speed air conditioner is one where the tap is either completely open or completely closed. So water (or heat in our case) is flowing out at full speed or not flowing at all. Inverter technology air conditioner is similar to a tap where you can control the flow rate. You can either slow down the flow of water (or heat in our case) or increase the rate of flow, depending on how much you need. Obviously, you can get more precise water level when you have more control over flow rate. Similarly, you can get more precise temperature control when you have variable heat flow. What is Cooling Capacity of an Air Conditioner? We talk about tons of air conditioning or cooling capacity in watts. It is analogous to flow rate in our analogy. This is the rate of taking out heat just like a tap will have a flow rate in liters/min. The more the flow rate, the faster the tank will empty. Similarly more the tonnage or cooling capacity, faster the AC will cool. A bigger tap will empty the tank faster, similarly, a bigger AC (more tonnage) will cool a room faster. Why is right sizing of Air Conditioner important? Imagine you put a super big tap for the tank. Water will pour out of the tank at a super fast rate. You will find it very difficult to maintain the right height, especially if you cannot control the flow rate. 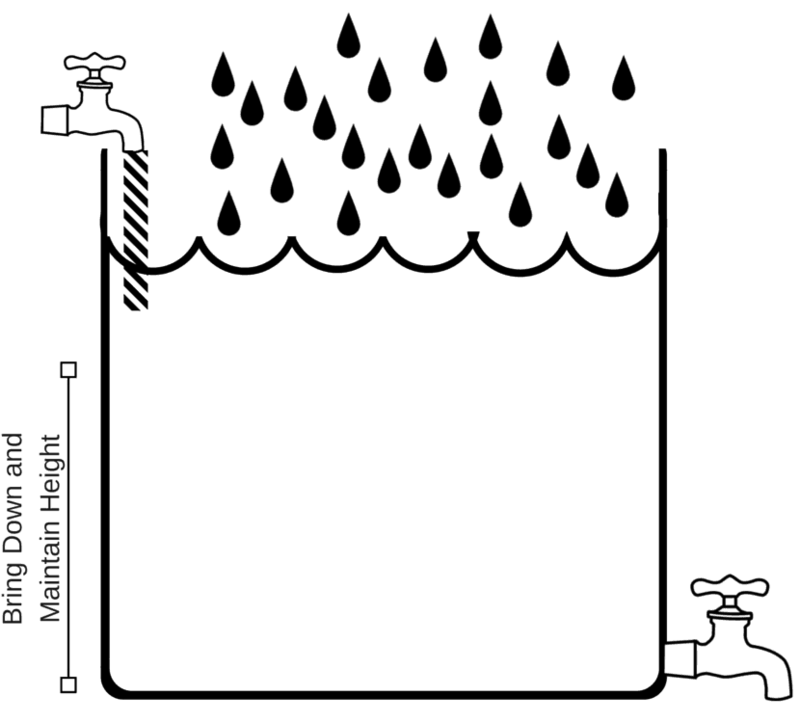 Or if the tap is too small, it will not be able to bring down the height of water and the tank will keep getting filled. Similarly, an oversized AC can cool really fast, but then if you have a fixed speed oversized AC, then it will have difficulties in maintaining the right temperature as it is either on or off. By the time thermostat senses the right temperature, it would have become cooler. So it results in over cooling. In the case of Inverter Technology AC, you still have control over flow rate and thus the rate of extraction of heat will slow down as the thermostat senses that the temperature is closer to the one desired. If AC is undersized, then it will not cool the room because there is too much to take out. Can an AC be used to cool two connected rooms? This case is analogous to asking, can my tap empty two connected tanks. Yes it can, but then the tap has to be bigger. Similarly, an AC can cool two rooms, but then you need a bigger AC that can handle the heat for both the rooms. Why do you need to keep a room completely closed while air conditioning? Imagine if your tank gets connected to a river, which is like an infinite flow of water. There is no way a tap can maintain the height of water in such case. Similarly, keeping a room open while air conditioning is like leaving it open to an infinite source of heat. There is no way an air conditioner can maintain the temperature of a room if the room is left open. Why is my AC taking so much time to bring down the temperature? This is one of the frequently asked questions that we get: My AC was able to bring down the temperature from 32 to 25 degrees in an hour, but it took 6 hours to bring it down further to 22, why is that? To explain this, just imagine water flowing out of a tap from a tank. As the height of water decreases, the flow rate of the tap decreases. So much so that when height nears the bottom, you have to tilt the tank to make it flow faster. This is because the height defines the pressure with which water will flow out. Similarly, the rate of heat flow also depends on the temperature levels we are trying to maintain. Cooling will be faster when you try to get it down from 32 to 25 degrees. But it will be much slower from 25 to 22 degrees. Most ACs are designed in such a way that if the AC is right-sized, it should be able to bring down the temperature of the room to 25 degrees (which is a very comfortable temperature) in a reasonable time (say about 1 hour). Temperature below 25 are quite chilly and if you really want to achieve temperature sub 25 really fast, then you need to go for an oversized air conditioner. With this post, we tried to explain the concept of air conditioning in a simple way. We hope that this helps you visualize how it works. If in future we get questions that we can connect to this analogy, we will keep adding those to this page. Do let us know your feedback/questions in the comments below.